ActiveXplorer 是一个文件管理和分析的类库和 .NET 集合，它基于 COM 库，包括 ActiveX 控件， TLBs, DLL 和 EXE 服务器。 ActiveXplorer 可以瞬间创建丢失文件，包括 CHM, HTML, 或 RTF. ActiveXplorer is a library file manager and analyzer for COM libraries - ActiveX controls, TLBs, DLL and EXE servers - and .NET assemblies. 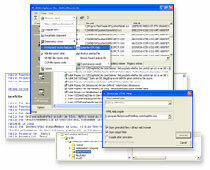 ActiveXplorer will create the missing documentation - CHM, HTML, or RTF - in a minute. COM 文档和 .NET 文件。可以很快地生成任意组件的技术文档。使用已存储在文件中的该类型的类库和映像信息，无需人工再次手写。生成的文件格式有 .html, .chm 和 .rtf. Why do I need ActiveXplorer? Escape DLL Hell. Solve installation problems, find missing files, and register files correctly. Manage your component files. ActiveXplorer shows the details of all COM libraries and .NET assemblies on your system. Know about the file versions, CLSIDs and installation paths. Keep your Registry in a good shape. Is your system registry up-to-date? Use ActiveXplorer to find missing files and clean the registry of extra entries. Right-click any COM file to register it correctly. View Registry entries. Browse the registry entries that are related to a component. Instantiate controls in your browser to see what they do. Compare file properties. Compare two files to see changes in file properties. Learn to use undocumented controls. Analyze any COM component or .NET assembly to see what's inside it. View the available properties and methods with descriptions on how they should be called. Document COM and .NET files. Generate a technical document for any component in a minute. Use the type library and reflection information already stored in the files without the need for a manual rewrite. Generated file formats are .html, .chm and .rtf. Review file dependencies. Find out which other files a library requires to work properly.